Nova Goods is a line of shibori home decor and accessories by Aubrey Wood. What makes it so LA is that it's equal parts hippie and minimalist. 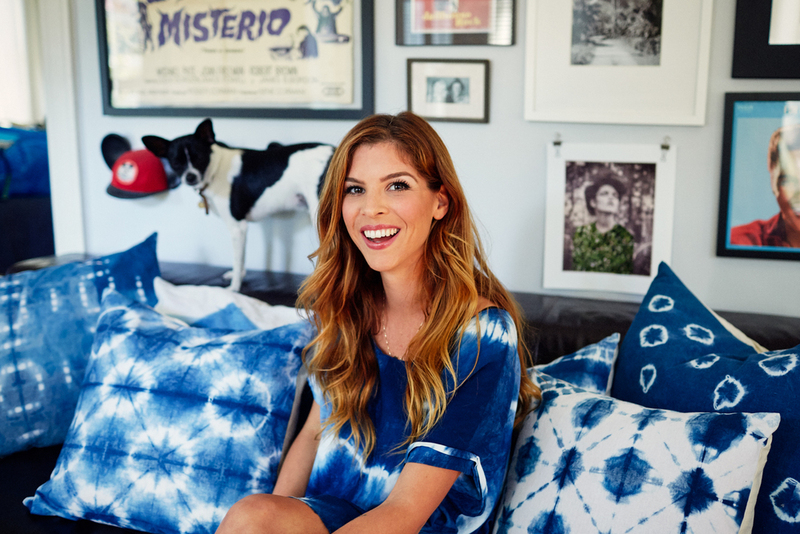 When I arrived at Aubrey's Larchmont bungalow, my eyes were instantly caught by her pillows with their rich, indigo shibori designs on the front and cream, linen pocketing on the back. Throw those babies on your couch or bed and you've got a clean, fresh LA vibe going on. Aubrey is constantly experimenting and creating new products in her studio so we will be updating our site with new products regularly. For today, I am thrilled to introduce you to Nova Goods and Aubrey Wood. How did you decide to start Nova Goods? I've always loved working with my hands and after getting burnt out on the world of acting, shibori provided a much needed creative outlet! After dyeing basically everything in my house with Indigo I decided it was time to start selling it. I feel like Shibori can be so meditative, sometimes I joke that it's my daily practice. What is your process when it comes to dyeing? I start with large quantities of linen or rayon and individually cut each piece. Then I start deciding what I want to do pattern-wise. I have a basic idea of what the final product will be but it's always a bit of a surprise, which is really exciting! Each piece is dyed in the Indigo vat separately after folding, binding, or stitching. I dip anywhere from two to ten times for each piece depending on how deep I want the Indigo to be. Between each dip I have to wait for the Indigo to oxidize (that's where it turns from neon green to Indigo) before I dip again. After I've achieved the hue that I'm happy with, I hand wash each piece and hang them to dry. I then iron each piece and begin the sewing process. My favorite part of Shibori is the state of mind it puts me in. It's borderline hypnotic and once I get into a flow I feel so peaceful and creative. I'm not a new-agey person, but a friend told me the other day that Indigo is the color of the 6th Chakra which represents intuition, clairvoyance, basically your "6th sense". Maybe there's something to that! Is there a story behind the name of the company? Yes! I named my company after the Chevy Nova my Dad owns. I've wanted it for as long as I can remember and to me, it's a symbol of great American craftsmanship. It's a totally badass car and it has stood the test of time. That is exactly what I want for Nova Goods. I want my pieces to be well made with the intention of being well worn. Like a great leather jacket or pair of jeans, I would love Nova Goods to become a new staple. My love for the changing landscape of California. All the pieces in my collection are meant to have multiple functions. I'd like to think that someone could lay on my Beach Blanket during the day and use it to warm up by the campfire at night. They are beautifully crafted pieces but I don't want them to be so precious. I want them to live full lives! My favorite piece would probably be the Beach Blanket. I worked for a long time to develop the pattern and I find myself using it all the time for different things. Tell us a little bit about your history before starting Nova Goods. I started acting when I was 8 and moved to LA when I was 20 for that purpose. It's still my passion but I love having something more hands-on to keep me grounded. Nova allows me to be creative without needing someone's permission. It is 100% my vision and I find that to be truly fulfilling. How would you describe your own personal style and do you think Nova Goods is a reflection of that? That's a funny question actually. I think that Nova Goods can be used in so many different ways to complement anyone's style. My pillows could be used in a boho beach house or in a contemporary loft downtown and look totally different. My personal style is very eclectic. My parents were always collecting things and I definitely inherited that trait. I think Nova pieces enhance my style perfectly and I find myself wearing my Nova Poncho constantly. That's a tough one. I'm going to cheat on this one and say that my favorite thing about LA is that it's so close to what I consider to be one of the most magical places in the world, Big Sur. But if I had to pick a favorite place IN Los Angeles it would be Griffith Park. All the different trails up there, so much to explore. I lived in New York before I moved here and the hardest part was not having any nature! LA is full of nature and the weather is always nice enough to be outside! We're spoiled. I usually try to get outside for inspiration. I get inspired hiking at Bronson Canyon a lot. The thing I love about LA though is that you can get in the car and drive a few hours and be somewhere totally different. The desert, the mountains, the ocean... we have it all here. California is such a stunning place and I really try to take advantage of it!